As a full-time traveller, if there’s one thing I know, it’s how to find great travel deals. I’m have ninja skills when it comes finding cheap flights, I got over $300 worth of free taxi rides in the USA in one month this year and when I book hotels I’m regularly securing rates that are 30%-60% off the rack rate. 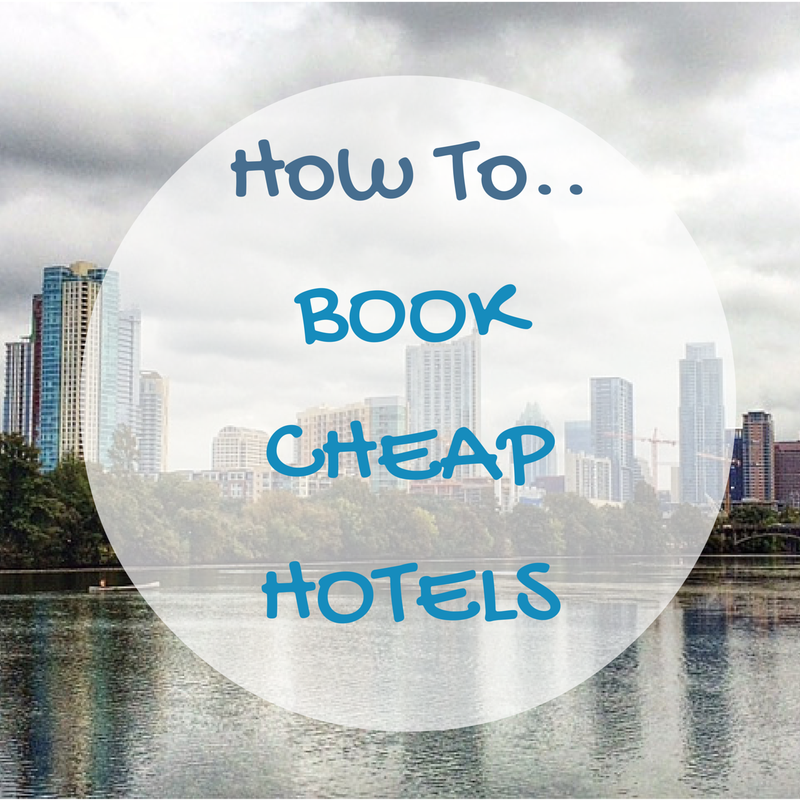 In this upcoming series, I’m going to show you how to book cheap hotels, flights and generally reduce your travel related expenses. So, let’s start with the obvious – there’s a glut of good hotel booking websites out there and it can be hard to choose between them. 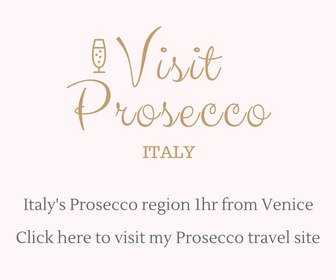 Even as an experienced travel booker, I bounce between the various sites on a regular basis unable to pick a favourite. However, in the past few months I’ve been having a lot of success using Priceline. And very specifically Priceline Express Deals, getting hotel prices that are otherwise unobtainable on the other booking sites. Note: this isn’t one of those articles where Priceline have contacted me and asked me to write damn spiffy fine stuff about their brand. In fact, they don’t even know I’m writing this. I have genuinely had great deals booking through their website, which is why I’m recommending them to you. Priceline is like many other hotel booking websites. You plug in the location, add your dates and it brings up a range of hotels to choose from, many at a discount. The prices there can be good, but there’s very little variation compared to similar booking sites. 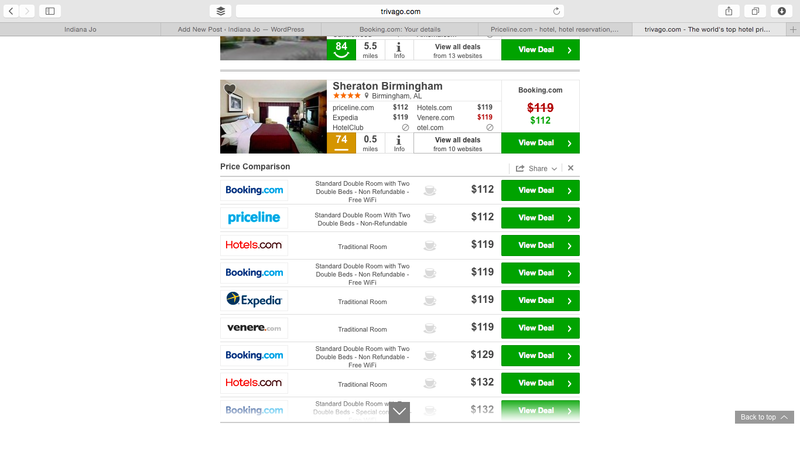 For example, search for a 2 night stay in Birmingham, Alabama, USA (a location I was recently looking to book) and the average price for a 3-4 star hotel like the Sheraton came in around $112 to $119 per night. Add taxes and that rate increases to $131.84 per night. That’s a decent saving off the rack-rate – booking direct on the Sheraton website would cost $163 plus a fee for Wi-Fi (free Wi-Fi was on offer through the booking websites). But I wanted to see if I could get a similar quality hotel for even less. Pro Booking Tip: I usually start all of my hotel searches using Trivago, which very quickly compiles the hotel prices across some of the biggest and best hotel booking sites out there. The screenshot above if from my search on Trivago. The most significant and unique fact about Priceline Express Deals is that the name of the hotel is unknown until AFTER you book. It’s similar to Lastminute.com’s Top Secret Hotels and is similar even to Priceline’s “Name Your Own Price” deals (though see below for a summary of the difference between Priceline’s different ways of booking hotels). It may seem like a risk – booking an unknown hotel – but not only does it lead to some amazing savings, there are several things you can do to make an educated guess at the hotel you’re booking. In fact, I’ve made three recent bookings using Priceline Express Deals and I’ve correctly guessed the hotel each time. 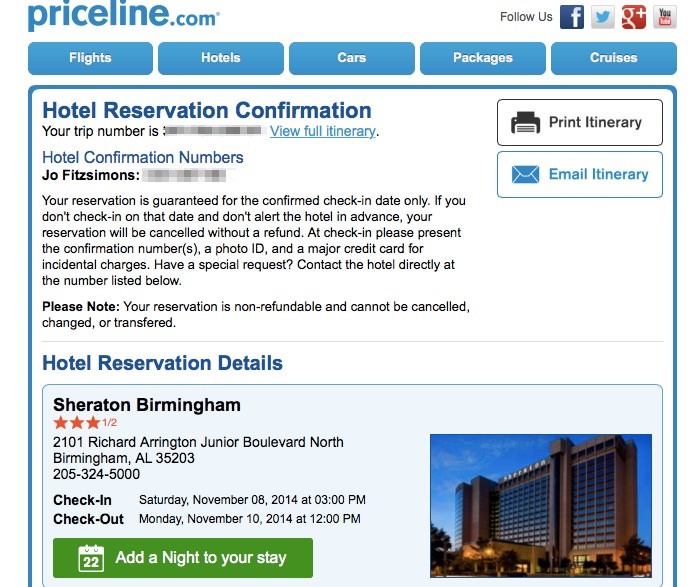 Priceline offers three options for booking cheap hotels. – The straightforward search, which often offers cheap hotel deals compared to booking with the hotel direct. – Name Your Own Price, which requires a bit of time, practice and patience as you effectively suggest a price you’d be prepared to pay for a specified star of hotel in a specified area (but you otherwise don’t know the hotel name). I’ve had great success with this mode of booking and will write about it separately. However, it can take days to book a hotel at the right price and there is sometimes a risk you will end up paying too if you don’t have a good bidding strategy. Also, I’ve been given low-grade “boutique” hotels in the past, which were disappointing. – Priceline Express Deals – similar to Name Your Own Price, you don’t know the hotel before you book but you do know the area and hotel star. Different to Name Your Own Price, the price is already fixed and you don’t need to engage in the bidding process – you can have the security of an instant booking. STEP 3: Presented with the Express Deals search results, you might want to go through and filter the results using the options on the left. 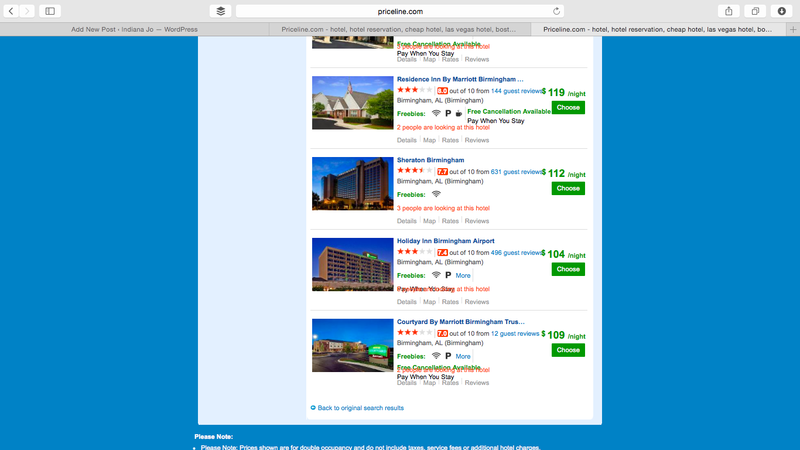 I usually filter by “Hotel Area” (for Birmingham, Alabama, I was interested in staying in the City Centre only). I also need Wi-Fi, so will check the “Free Internet” box under “Hotel Amenities”. After applying these filters, you’ll see I’m left with 3 hotel options. 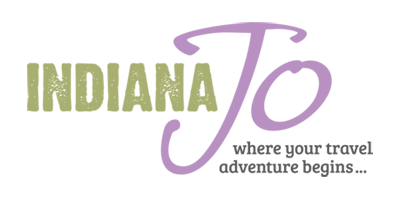 Note: if you need a broader range of hotels (or prices) to choose from, consider adding back in more locations or reducing your hotel amenities. If you’re a gambler, you might just want to go straight ahead and book one of those hotels. But, if you’re like most people, you want to understand a bit more about what you’re getting into. Now, the whole point of these Express Deals is that you don’t know which hotel you’re booking. But that’s doesn’t mean you can’t do some detective work. 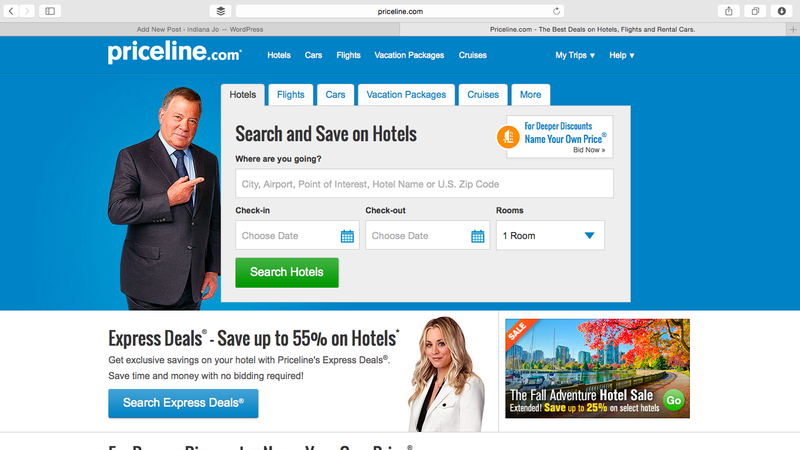 And the best starting point is with Priceline’s own website. 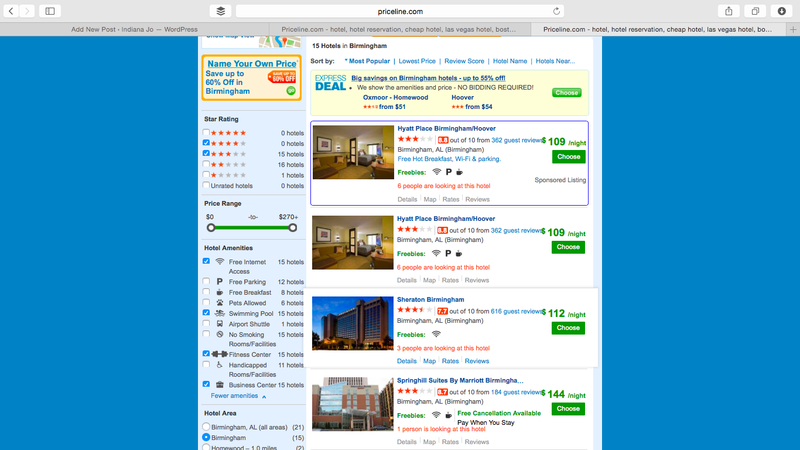 Using my Alabama search as an example, the first deal – $75 per night 3.5 star hotel in Central Birmingham Area interested me. It was a higher star rating for less money than the $91 per night deal. And the 1-star, $45 deal didn’t appeal. So, focusing on the hotel I was most interested in, here’s what I did to try and establish which hotel I might get. STEP 1: Do a straightforward search on the Priceline website for the same destination and dates – the logic being, Priceline is probably also selling rooms at the hotel on a named basis. Of course, this isn’t a given, but it’s a fair assumption. I then filtered by my preferred city location (city centre) and my required hotel amenities (free wi-fi). Even with filtering, I had a list of 57 hotels – too long a list to do anything sensible with. I needed to do something more. STEP 2: To whittle down the 57 hotels to a more likely shortlist, I next looked at the details Priceline had provided about the Express Deal hotel I was interested in. Using that information, I went over to the straightforward search results (my list of 57 hotels) and added those filters to the Hotel Amenities section on the left. Refreshing my search, I had whittled the selection down to just 15 hotels. It was a much better short-list. But still, it could be shorter. Note: the straightforward search didn’t offer a 3.5 star choice so I selected both 3 and 4 stars in my search. STEP 3: The final piece of information I had in my detective toolkit was that the Express Deal hotel had a guest rating of 7+. 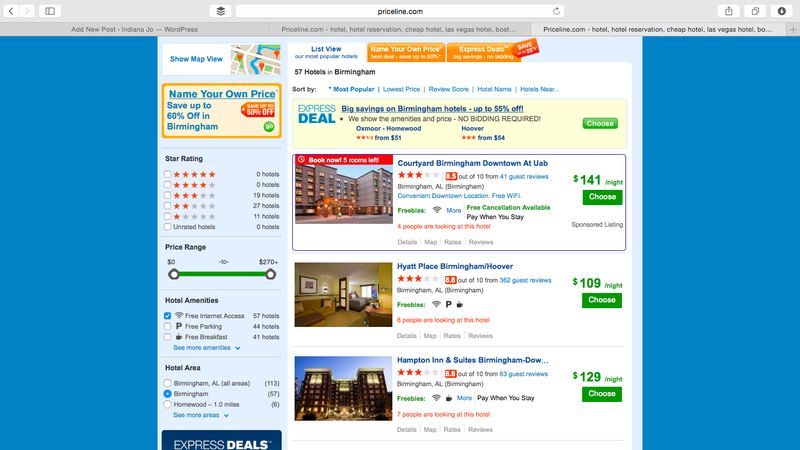 Returning to my straightforward search on Priceline, I used the buttons at the top of the search results to sort the hotels by review score. Better still, of those three hotels, only the Sheraton featured a rating of exactly 3.5 stars (the others were only 3 stars). It was a pretty compelling indication that Sheraton was the hotel I’d be booking. But even still, before booking, I made sure I would have been happy with any of the shortlisted hotels for $75 a night. Excited to see if my guess was correct, I went ahead and booked. My reservation confirmed that I had, indeed, booked a deal at the Sheraton. One of the downsides of using Priceline Express Deals is that the prices quoted exclude taxes and fees. However, even with that being the case, the price paid is still very competitive. The Sheraton I booked was listed as $112 per night but would actually have cost $131.84 per night after taxes and fees. The price was the same if I’d used a similar discount hotel website, Booking.com. And, had I booked direct with Sheraton, I’d have paid $163 booking direct with Sheraton. The final price I paid, including taxes and fees using Priceline Express Deals was $93.07 per night. In fact, I also had a code from a previous booking that gave me a further reduction of $15 for booking through Priceline’s app, so my final price was even lower. In terms of percentages, the price I paid was 25% lower than booking with a discount hotel booking website and a whopping 43% discount off the hotel rack rate. 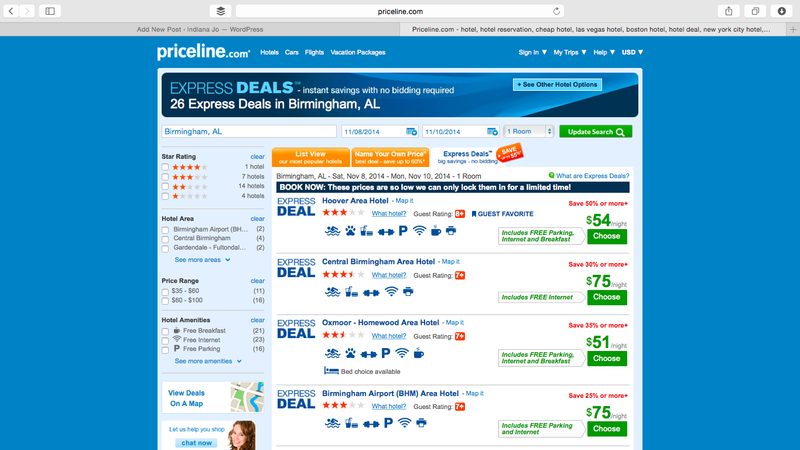 What I like about Priceline Express Deals is that the deals are consistent. I booked a hotel in Dallas at $81.86 instead of $174.27 (through a discount hotel booking website) and $174 compared to the the rack-rate (all prices including taxes and fees). That’s a saving of 53% or nearly $100 a night. And I’ve just booked another hotel, a Courtyard by Marriott, in Alabama for $65.79 a night compared to $152.44 per night. Had I booked with a discount booking website, I’d have paid $152.55 – more than booking with the hotel direct. Again, all prices include taxes and fees. That’s another huge saving of 57% or nearly $100 a night. If you multiply that saving over a week or two or more, that’s a huge discount. I don’t know about you, but I’d rather put my extra money towards something more useful…like food or wine or another trip! As much as I’m enjoying Priceline Express Deals, it vital to understand that even with all the detective work in the world, you will not know with certainty which hotel you’re booking until AFTER you book, at which point, “All sales are final” i.e. even if you don’t like the hotel you get, you have to pay for it. So, you can do as much detective work as you can. But there is no real certainty with Priceline Express Deals. If you’re happy to take the gamble, you can win some pretty great deals. 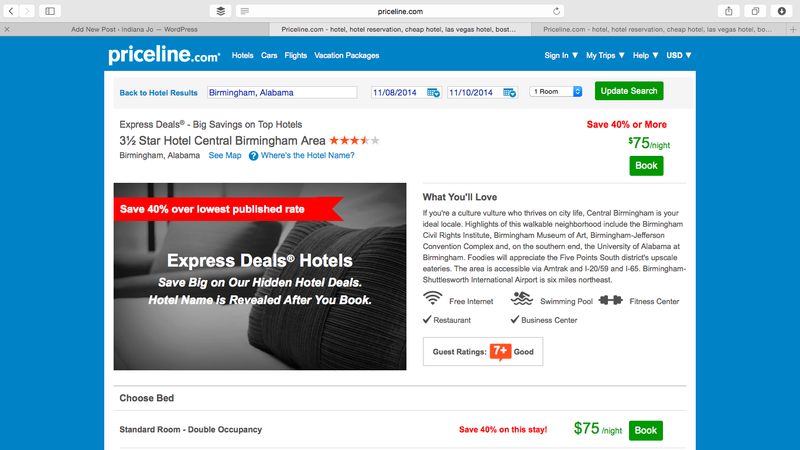 Have you ever used Priceline Express Deals? Have you made any other great hotel savings or have any extra tips to share? Let me know in the comments below. Free perks and other benefits are more easily accessible if you book hotels directly and speak to hotel staff. Best way to find out is to try for yourself and book hotels directly. There are numerous listings site to search hotels website. Thats interesting Dev, but I’ve mostly found hotel rack rates to be way more expensive than online rates…but I can see speaking to hotel staff in smaller places might work. I’ve never used Priceline for the reason of not always being able to get points as a frequent stay. As a Hilton Honors member, I’ve been able to stay free in places like India and Thailand. So, the whole point things is pretty important.